Can you beat that? No. You can’t. So, we are introduced to Lady Julia and Nicholas Brisbane, who, after the death of Julia’s husband, must work together to discover whether or not his death was really health-related or if it could have been something more sinister. Speaking of sinister – of all the historical mystery series I read and love, this one is easily the darkest and most gothic. These themes add such richness and depth to the stories and the characters; it is remarkably easy to get lost within the pages of Silent in the Grave. If you were a man, your ladyship, I would cordially horsewhip you for that remark. Who could resist that, right? And, not only are the plots dark and twisty-turny enough to please any mystery lover – but there are so many laugh-out-loud moments as well! 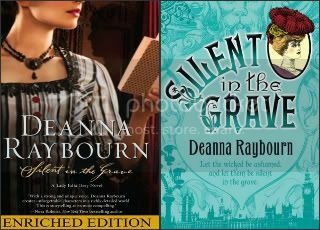 Seriously, there is nothing that you could want that Deanna Raybourn and Silent in the Grave won’t provide you with. Most of the funny comes from the fact that Julia’s family, the Marches, are mostly insane (or barking mad, as she likes to put it). If you have read this book, I’m betting you loved it. If you haven’t – hopefully I’ve convinced you to do so. It highlights all the reasons I love to read: amazing plot and overall tone, and characters I enjoy so much that I reread the books over and over again for a chance to revisit them. This is a world you need to get lost in, y’all! Also…check out some of the other covers the book has gone through, I can never decide which of the three I like the most! I started reading this series after your initial recommendation earlier in the year. LOVED! the best series you have ever read?? I am a series addict, so I am headed over to B&N to obtain the first book…thanks for sharing this! I bought this a few months ago because I just kept coming across glowing reviews – obviously this is no exception. Now I’m just frustrated that I’m in the middle of another book and can’t go and grab it straight away! Brisbane! ILY FOREVA AND EVA AND EVA! You are definitely not the only book freak who looks at her books after reading one that has been on the shelf forever and goes WOW these are all potential favorites. I do that too. Then I skip on over to the next big hype book. This is an awesome review and I will be grabbing this. I am always looking for books that are more like love affairs than entertainment. I have this waiting patiently for on my shelves and now I’m wondering if I’ve waited too long to read it. You’ve convinced me that I need to read this book sooner rather than later…thanks for the great review! I have been meaning to read this book for AGES and AGES. That first line is AWESOME and I’ve wanted to read this book ever since but have just never gotten around to it. But I love how much you love it! Ashley B recently posted..Happy New Year! !